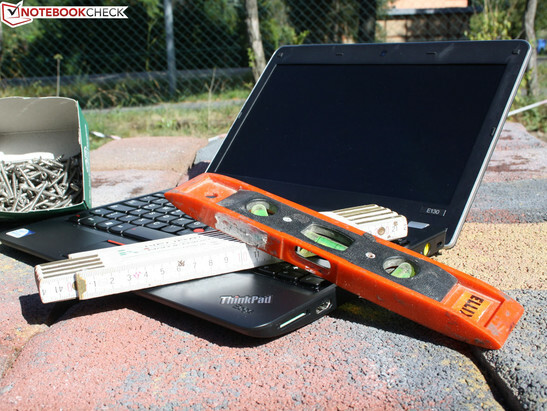 Lenovo ThinkPad Edge E130 (NZU5FGE): The affordable multi-tool gadget for everyone? 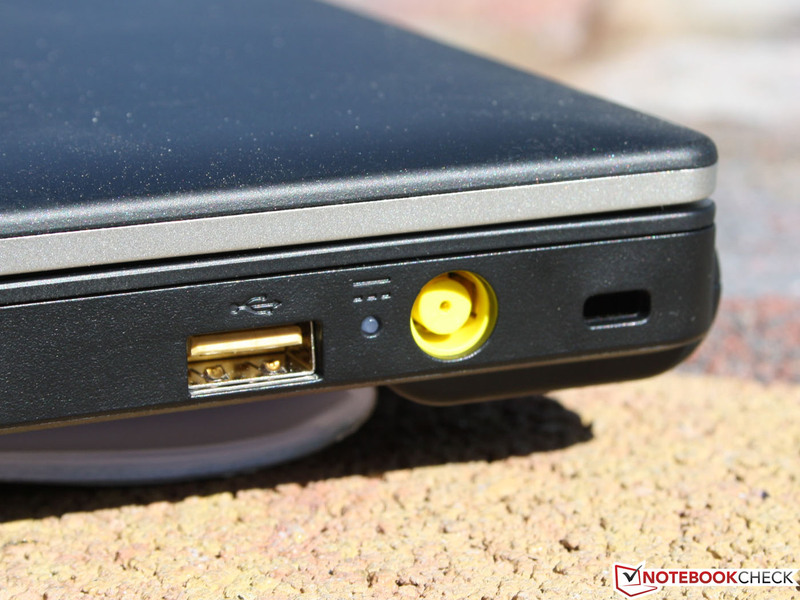 Lenovo launched its ThinkPad Edge series in 2010. 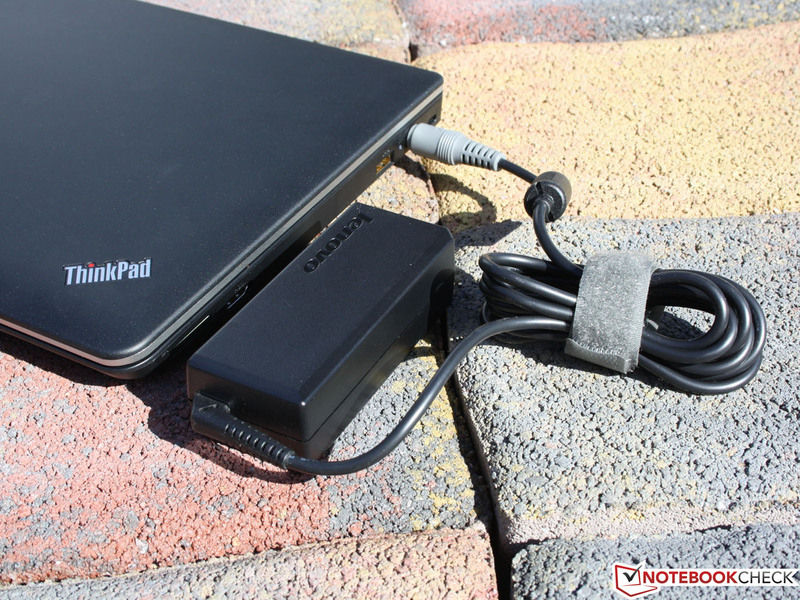 The pro sides of a ThinkPad - in particular everyday suitability and very good inputs - were to be made available to everyone for a low price in form of the Edge. 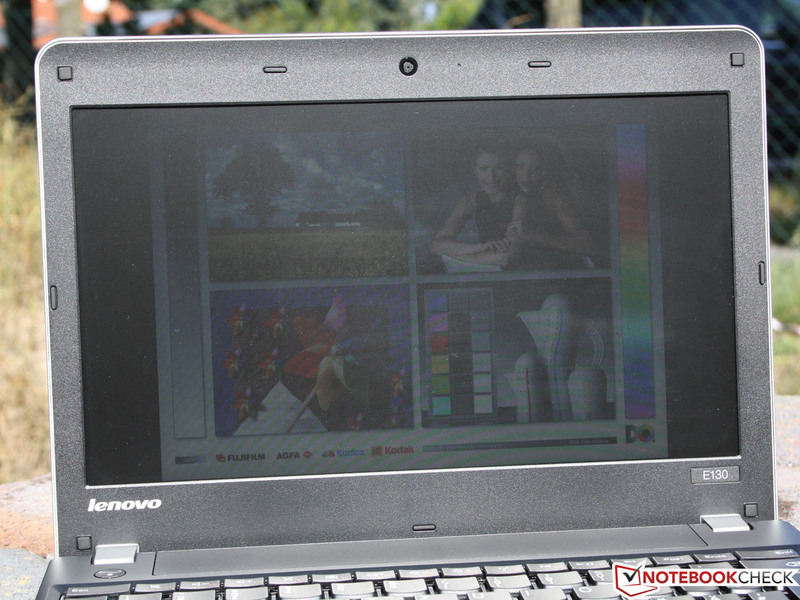 It began with the Edge 13 subnotebook (HD 3200, AMD Turion Neo X2 L625), followed by the 15.6-inch Edge 15 and in late 2010, the Edge 11 was released. Although Lenovo has always reserved a place in its series for AMD's components, the first and today's 11.6-inchers are based on an Intel platform. The Core i3-380UM has now been replaced by the Pentium 977 (Sandy Bridge). The AMD alternative E135, in review at the same time, should not be kept secret. A steep price of 700 Euros (~$912) (RRP) was demanded for the Intel-based Edge from late 2010. Today, Lenovo only demands 375 Euros (~$488) for the free-DOS version; our Windows system is available for a price starting at 430 Euros (~$560) on the virtual shelves. We wrote it in the first paragraph: the 11.6-incher convinces in many fields. Is it a phenomenal offer for little money? Is the market-share groping manufacturer giving away its devices in order to sell as many as possible? Find out in the review whether there are really no drawbacks. One thing is certain: the handy chassis does not try to catch attention with daintiness. A weight of 1518 grams is over the average of other 11.6-inch devices. The Aspire V5-171 weighs 1326 grams and Asus' UX21E in an aluminum unibody reaches 1147 grams. 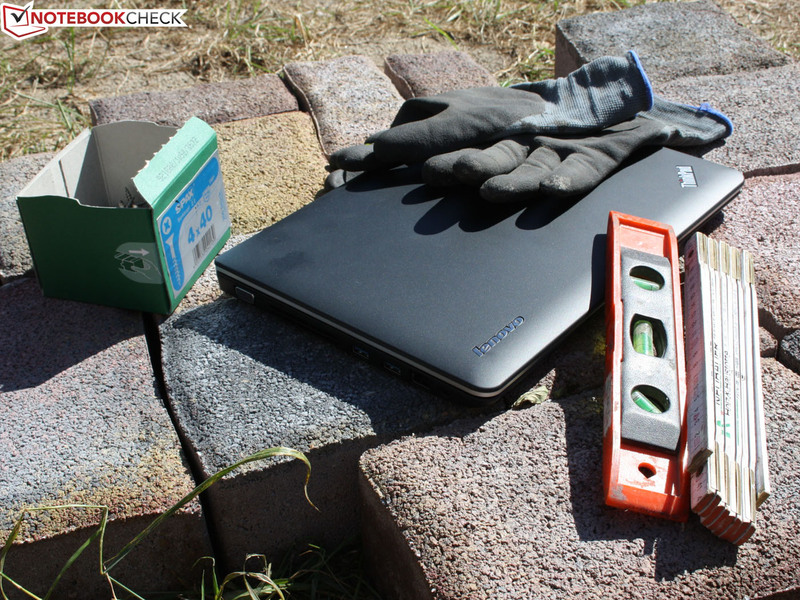 Even Wortmann's 14-inch 1450 II ultrabook has a better weight/inch ratio with 1634 grams. The weight of the angular casing with rounded corners is noticed accordingly. The Edge E130 nevertheless has a nice feel to it; the non-slip yet sleek surfaces of both the wrist rest and lid are pleasant to use. A red lid is optionally available besides the black one. 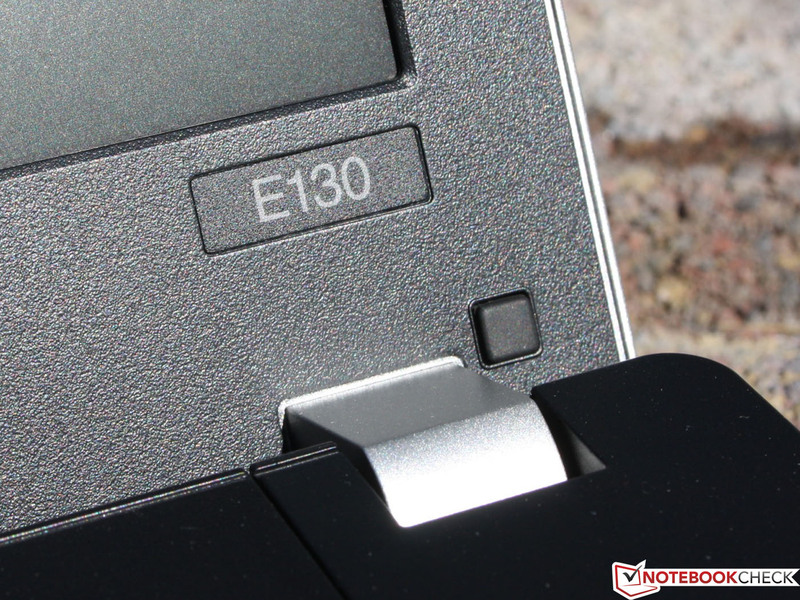 We refer to our upcoming review of the E135 sister model (AMD version) for more details. 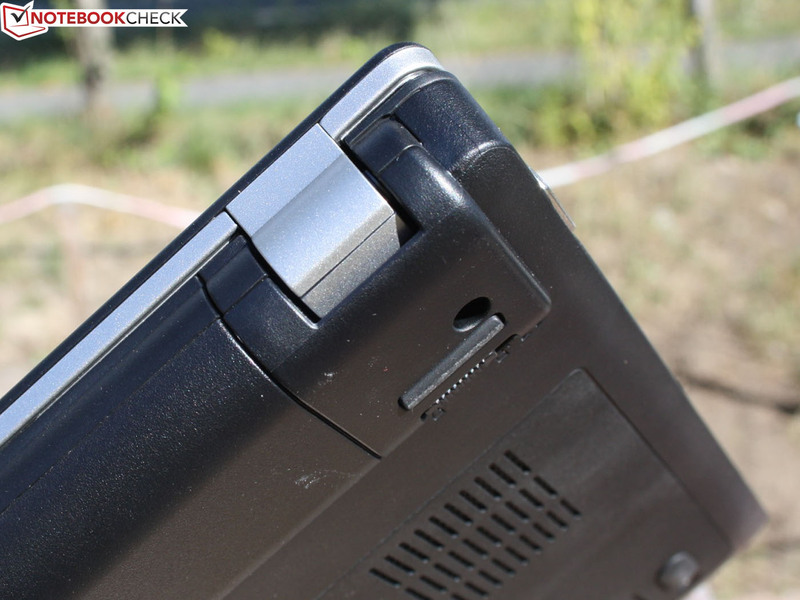 This laptop features exactly the same casing, interfaces and build-quality. 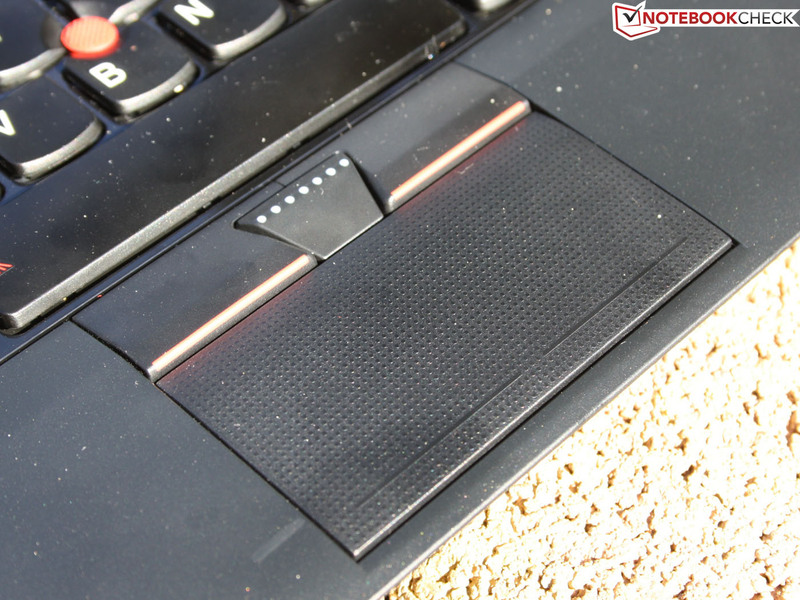 Like in previous Edge models, the i-dot of both ThinkPad logos (lid + wrist rest) is illuminated by a small, red LED (permanent when in use / blinks during sleep). The hinges keep the lid connected very securely to the base unit. That is favorable for transportation, but we need both hands for opening the lid anyway. The opening angle has shrunk to approx. 135 degrees due to the lowered hinges (Edge 11= 180 degrees). The hinges are not made of solid metal; they are underneath a silver-colored plastic cover. The plastic chassis proves to be very pressure resistant and the screen's stiffness is outstanding for this price range. We can only dent its surface by applying high force. The base unit warps marginally. The user will notice this when the laptop is picked up at a corner (opening). However, it would be bold to expect a highly rigid chassis in this price range. The battery fits tight in the case and leaves a gap above the keyboard when it is removed, for example during permanent AC-mode. Everything is in and on it. If you need reason for complaint despite two USB 3.0 ports, you might list the lack of a docking port. 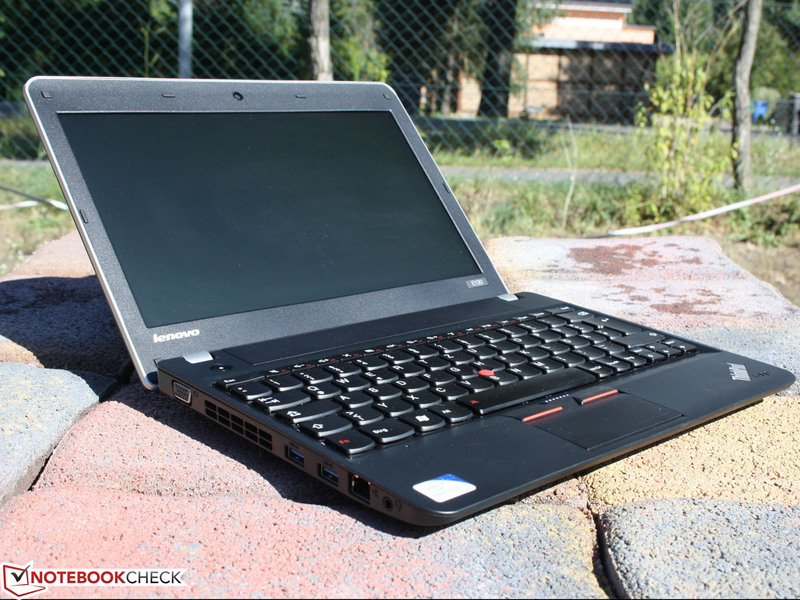 This convenience is however only found in the 12.5-inch ThinkPad X230 and costs at least 1300 Euros (~$1695). What really hurts is that the power socket and VGA port have been removed from the rear. The Edge 11 (2010/2011) could banish two main cords from the field of view. 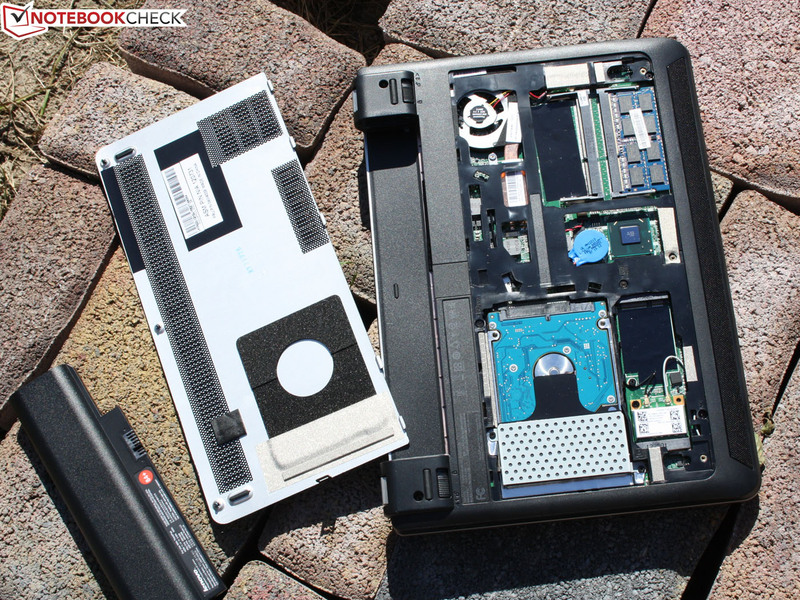 Realtek's PCI-e Gigabit adapter and Broadcom's draft-n Wi-Fi card are the appropriate companions for the laptop. 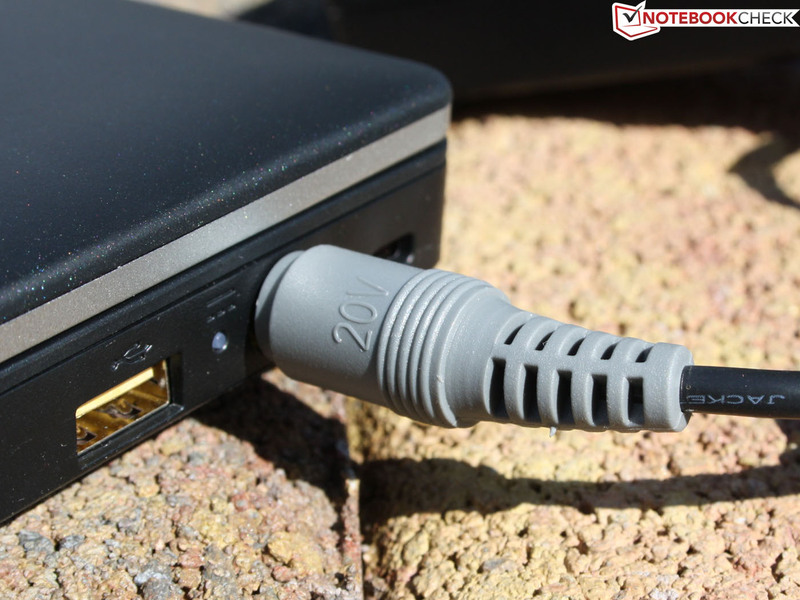 Only few low-cost laptops sport Fast Ethernet nowadays. Bluetooth version 4.0 is also available for connecting small appliances, e.g. a smartphone. A 3G module for mobile internet access would be a perfect match for the good battery runtime. An E130 version with this feature is available for 620 Euros (~$808). The surcharge is so steep because it is the high-end configuration sporting a Core i3-2367M. Upgrading is also not an option since the second mini PCI Express socket is not soldered. The webcam has a low resolution of 640x480 pixels. That is enough for video calls and snapshots in all of life's circumstances. However, a very evident noise is noticed in weak light. Taking pictures in bright sunlight is virtually impossible (flowerpot, pumpkin). 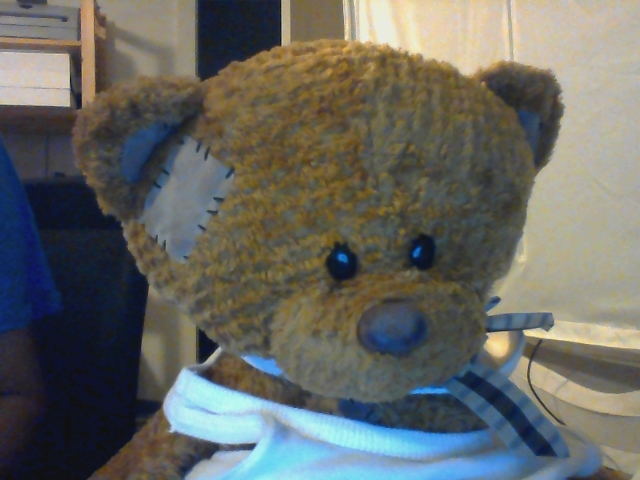 Even indoor pictures (teddy bear) quickly fade due to the oversensitive sensor. 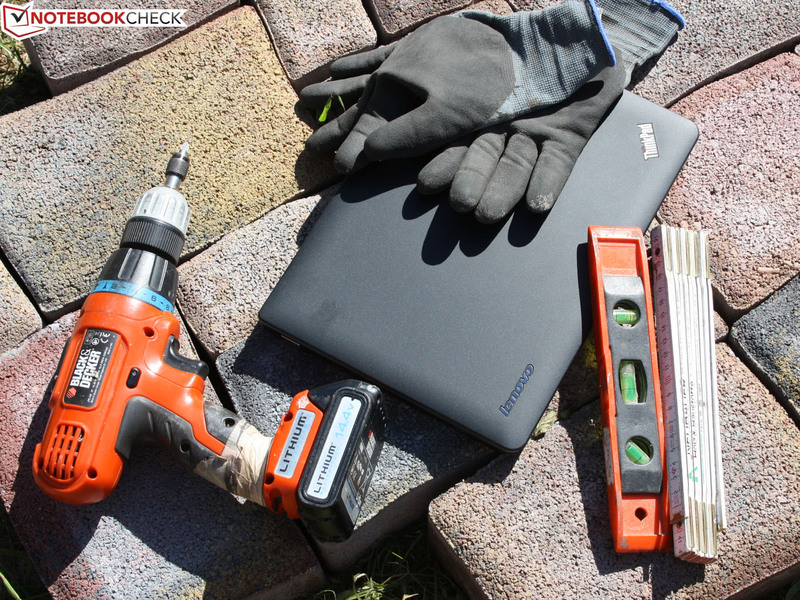 Lenovo installs its ThinkVantage tools. This is a bundle of programs and tools relating to recovery, backup, hard drive protection (shock sensor), driver updates and power management. It also includes webcam software that optimizes the camera and microphone for video conferences. Most settings can also be modified via Windows' system control, but their grouping in one place is very helpful. 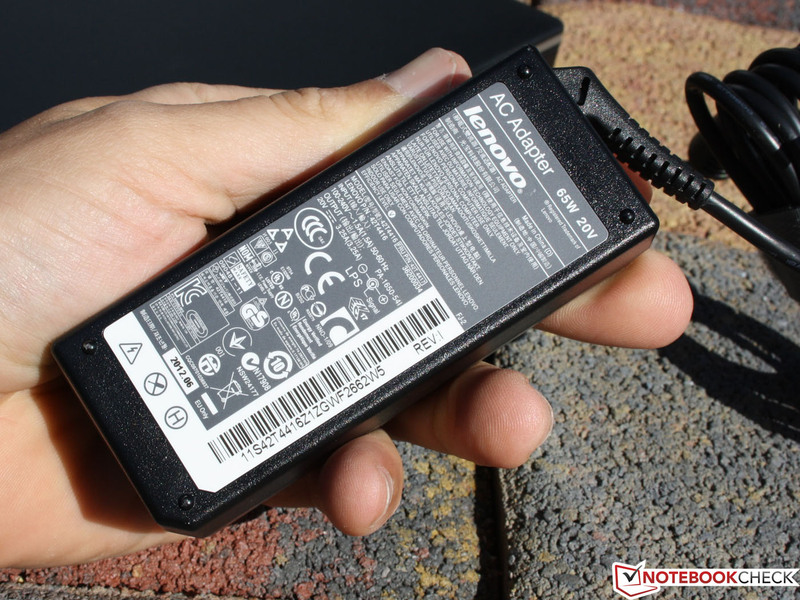 Apart from the laptop, battery and PSU, we only find a brief quick start guide with reference to e-manuals on lenovo.com. 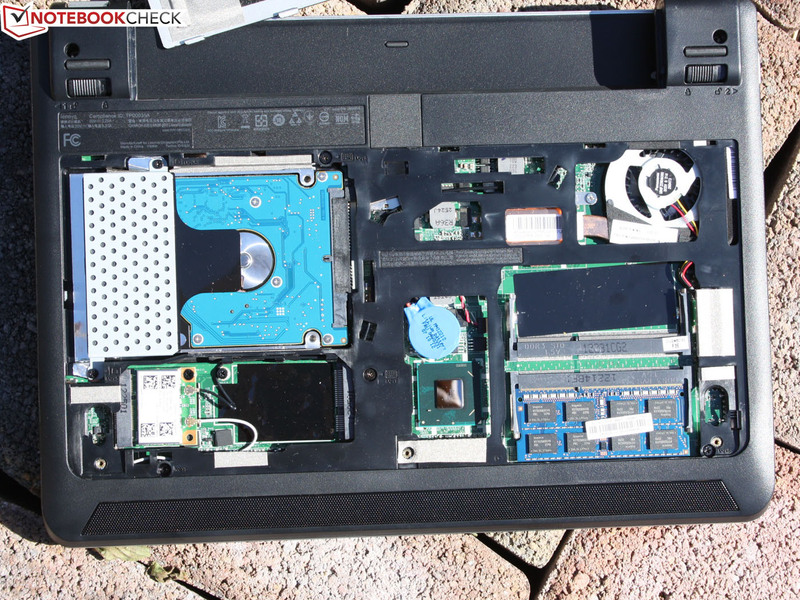 Accessing the innards is very simple: After removing three screws, we lift up the cover and that's it. One 4 GB working memory bar is inserted and there is room for a second RAM unit. The HDD is screwed to the frame. The fan is easy to blow clean. 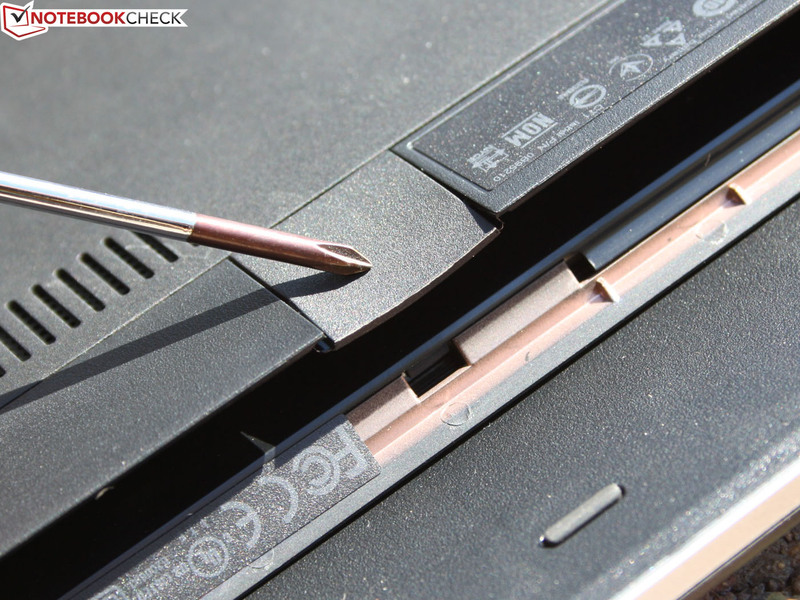 The laptop automatically includes a 12 month bring-in manufacturer warranty. The user sends the laptop in at their own expense. That is the minimum warranty for a laptop. 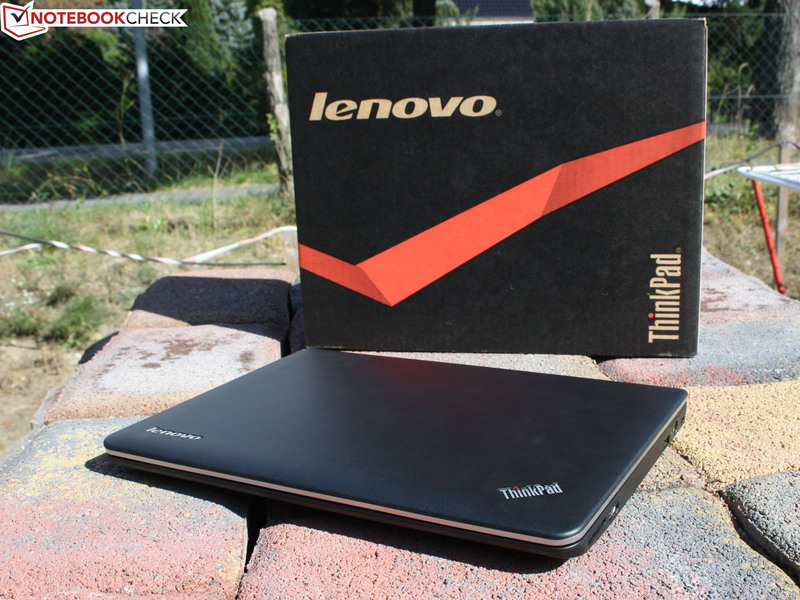 The period can be extended to Lenovo's ThinkPlus 2 year bring-in warranty for mere 40 Euros (~$52). Beyond that, many warranty bundles including the most diverse services can be found at Lenovo or in online shops. groups system and security tools. 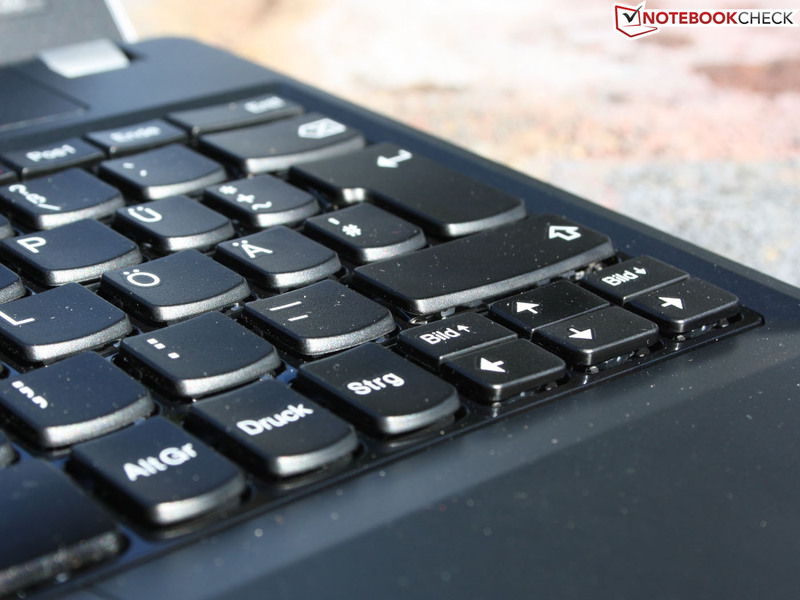 It is possible to type on the Edge E130's chiclet keyboard flawlessly right from the start. No familiarization period is needed because the sufficiently sized keys feature a crisp pressure point and a clear drop of roughly two millimeters. The latter is extremely rare for laptops and only found in expensive Office machines or workstations. Especially since subnotebooks are getting increasingly slimmer, the key drop is always very limited. The standard layout exploits the entire width. Enter and shift exhibit an agreeable size. The fingers glide extremely accurately over the keys. This is due to the convex (slightly curved) shape that always guides the fingertips to the key's center when touch-typing. 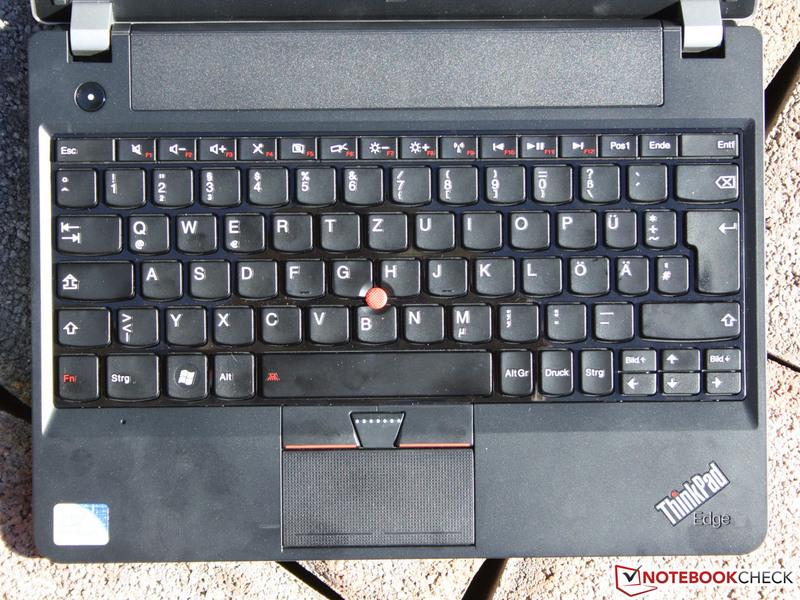 Lenovo implements the FN function keys on the rarely used F keys. 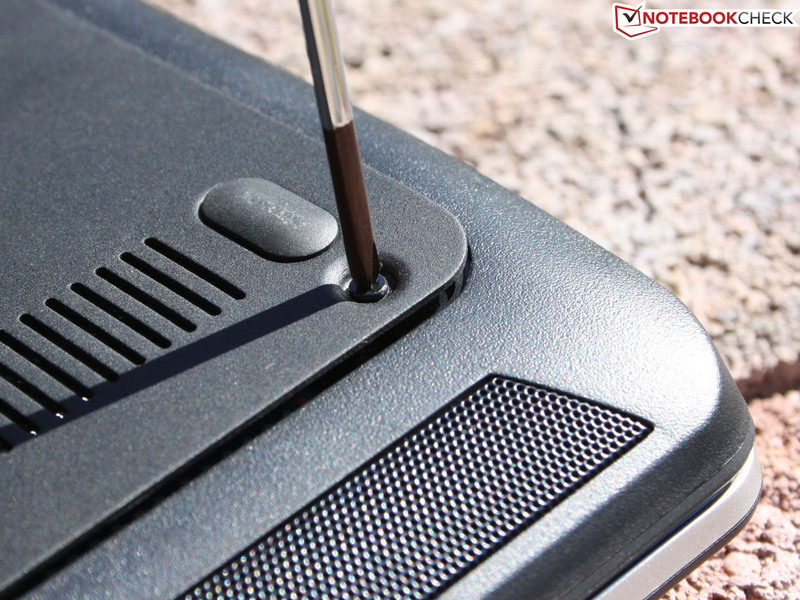 They are initially assigned to volume, brightness, microphone, wireless or stop/play. A number pad is not available via the FN keys. The Dual Pointing device can either be used as a TrackPoint and key or ClickPad and key combo. The left and right mouse buttons are located below the pad. 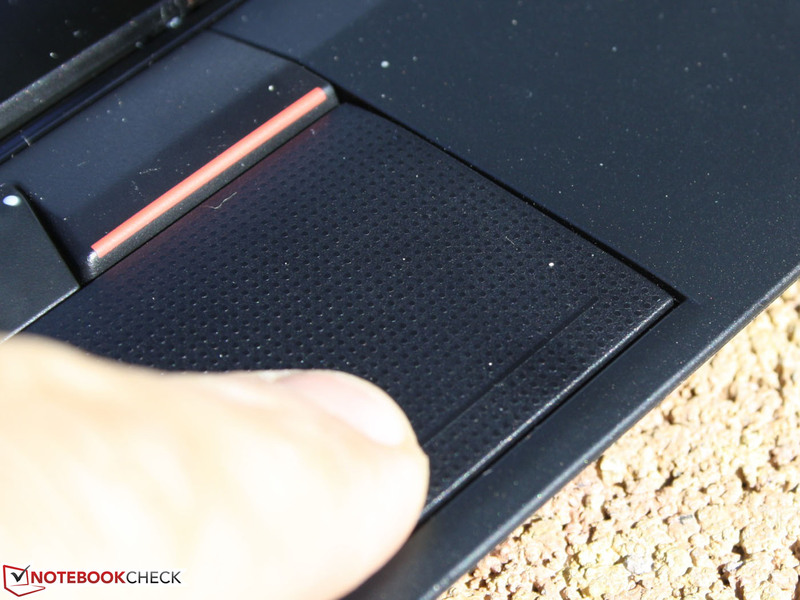 Using the red TrackPoint keys for touchpad operation proved to be handy during the test. The center key is used together with the TrackPoint for scrolling. 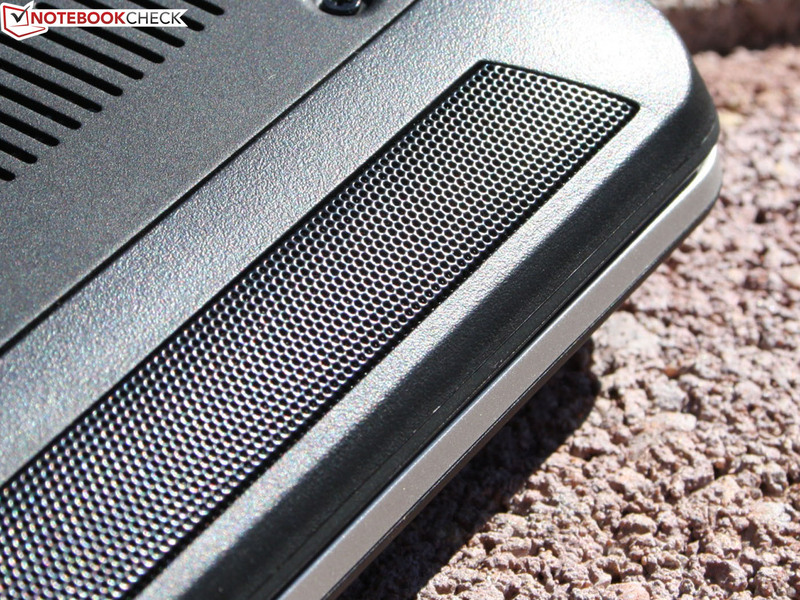 The ClickPad is fairly small and features a lightly roughened surface. Scroll fields are not marked but available after activating them in the Synaptics settings. 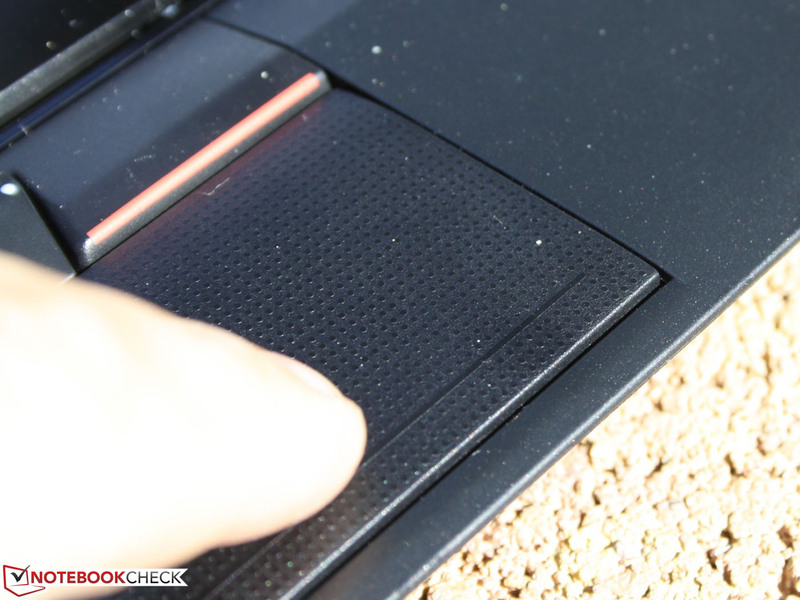 The ClickPad's stop is short, particularly when a left mouse click is to be performed in the center. The stroke is much more pleasant at the very bottom. However, clicking there triggers a right mouse click. Both pointing devices can be configured individually via Ultra-Nav-Management. The 11.6-inch screen comes from Cimei Innolux (model: CMN N116BGE-L32) and has the usual resolution of 1366x768 pixels for the screen size. The TFT has clearly been AR-coated; the contrast of 149:1 is below average. Black does not look saturated and colors are not bright. However, there are no alternatives available in our test device's price range. sRGB and AdobeRGB color spectrums are failed clearly. That is common for basic TN screens in a price range of up to at least 800 Euros (~$1043). 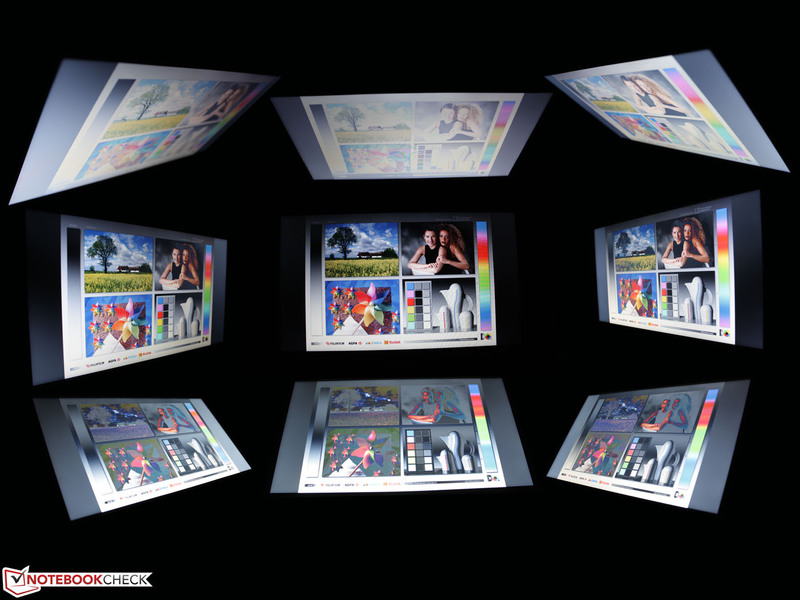 The color space coverage is only important for professional image editors though. The screen's average brightness of 200 cd/m2 is better than in earlier ThinkPad times where laptops usually only featured dark 130 cd/m2 screens. The brightness is absolutely sufficient for indoor use. However, a much too dark screen torments us outdoors. Depending on the light incidence, reading becomes difficult up to impossible and you do not stand a chance when you view the screen from the side. The Edge does not reduce the brightness on battery power (energy-savings). The CMN screen is only very good regarding brightness distribution: a homogeneous brightness distribution of 88%. The horizontal viewing angles are acceptable although they are limited to approx. 45 degrees like in many other laptops. Colors do not distort (invert) up to that angle. They first invert slightly up to visibly beyond that (so-called ghosting). However script can still be read up to about 70 degrees. 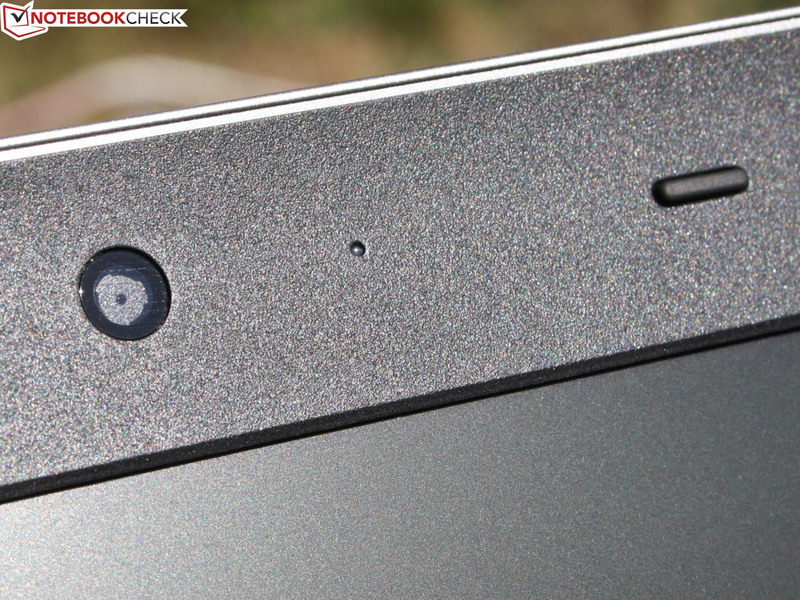 The viewing angles are much narrower when looking downward, so vertically. Script can only be read well up to 40 degrees and colors start to falsify at 20 degrees. Two CPU versions of the Edge E130 are available currently: the Pentium 977 (in our test device) represents the entry-level model and starts at 390 Euros (~$508) as well as the Core i3-2367M as the premium model that starts at 540 Euros (~$704). 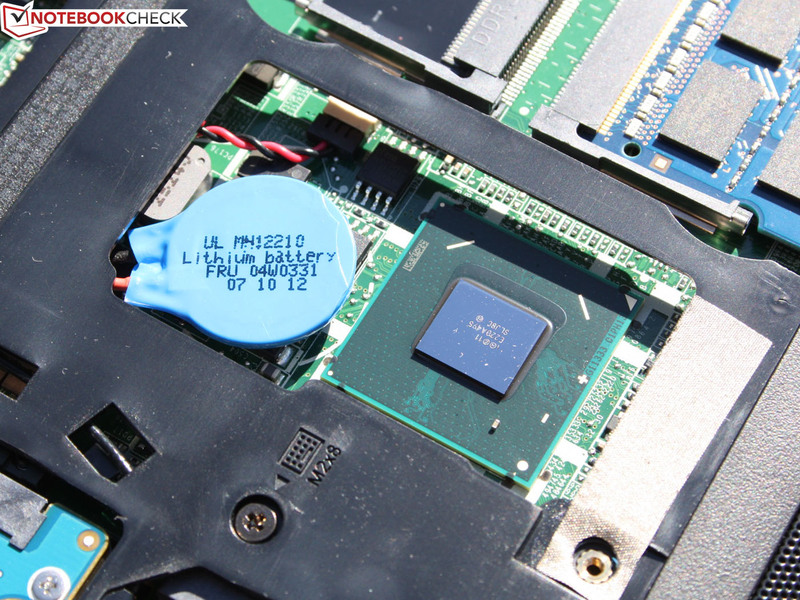 The Pentium 977 sports two cores with a clock of 1.4 GHz. The 17 watt CPU from the Sandy Bridge architecture (2010 - 2011) makes an outdated impression because it was replaced by Ivy Bridge in mid 2012. Turbo Boost and Hyper Threading are unknown features for the Pentium as well as for the alternative Core i3-2367M. In the following paragraphs, we will assess whether the i3 performance advantage justifies the high surcharge. The integrated graphics is Intel's HD Graphics. 4096 MB of working memory from Hynix are inserted as a single 4GB bar and Seagate's Momentus Thin 320 GB HDD complete the bundle. 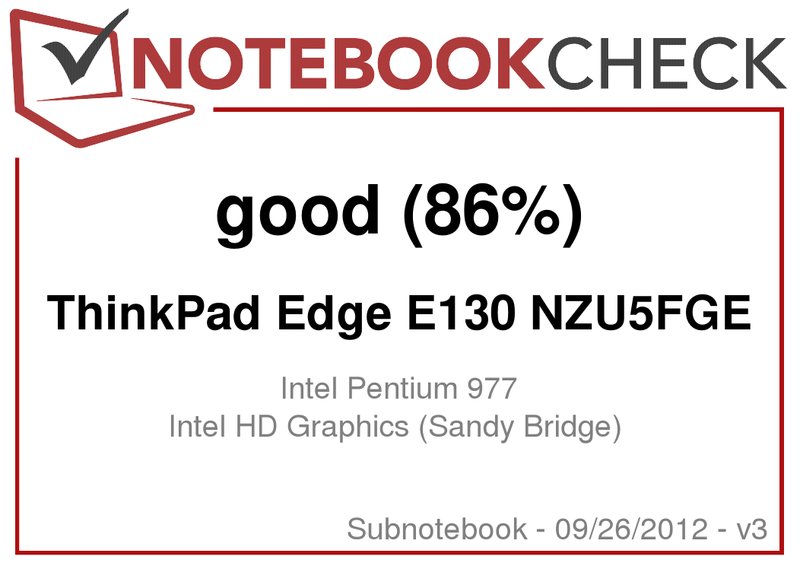 Basically, the Edge E130 is a good subnotebook. Thus, interested parties may ask whether the Pentium 977's (1.4 GHz) computing power is sufficient or whether the expensive Core i3 version represents a more solid investment for the future. Furthermore, there is also the APU-based Edge E135 that only costs 350 Euros (~$456) without Windows. We compare the computing performance by using Cinebench R11.5 64 bit single and multi-core test. The following bar graph shows that AMD's E2-1800 (E135) is 32% faster than the Pentium 977 when calculating graphics only. However, it is hopelessly inferior in pure CPU load. 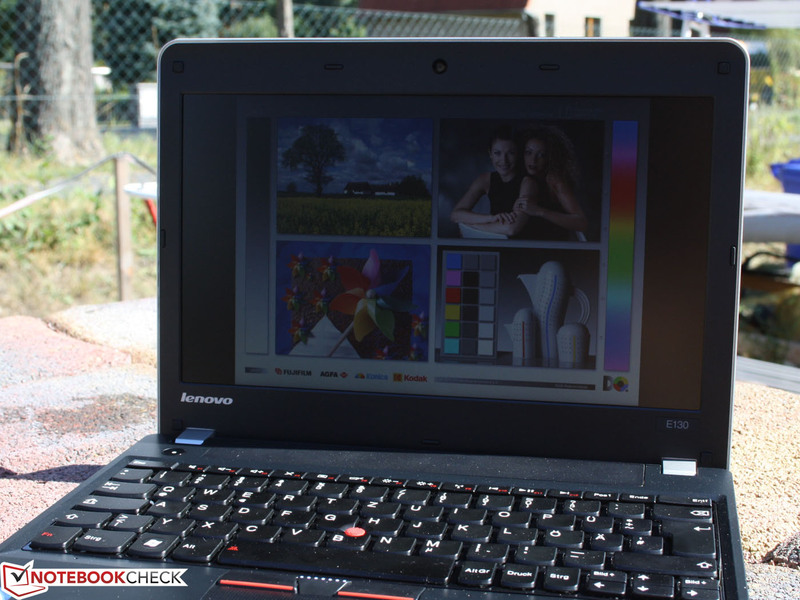 The alternate i3-2367M is a bit better with its superior HD 3000 in the GL test (+18% Toshiba Z830). The advantage of 23% in the multi-test is also within limits. 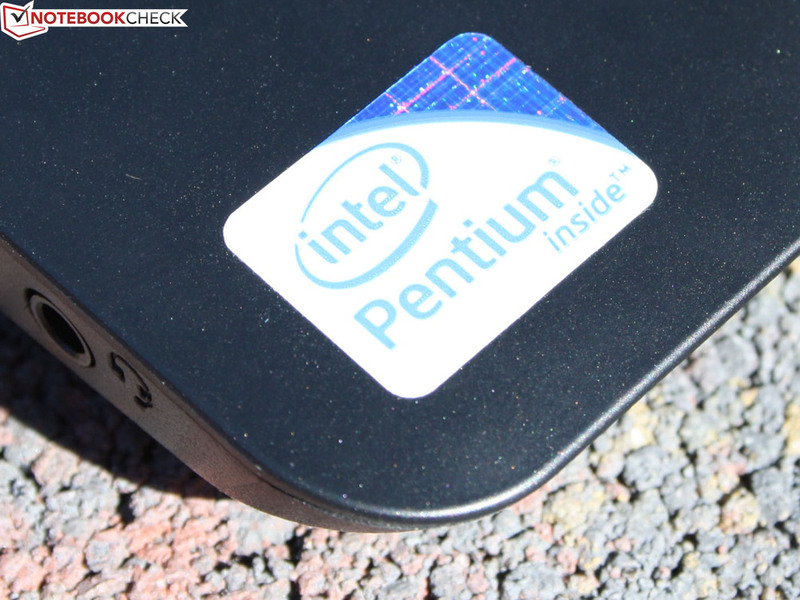 In a nutshell: performance fans will neither be happy with the Pentium nor the Core i3. If ThinkPad advantages are only secondary, it might be worthwhile to take a look at Acer's Aspire V5-171 featuring a Turbo Boost Core i5 and HD 4000. By the way, both CPU and graphics performance are also available on battery power. The tests showed similar results (OpenGL test also). Unlike AMD's E2-1800 (E135), there are no significant differences seen between the Pentium and i3 in the CPU tests. Will the classic application benchmarks PCMark Vantage and PCMark 7 reflect this? In addition to the computing performance, the hard drive, working memory and graphics card are influencing factors here. PCMark 7's score of 1540 points is roughly 30% better than with AMD's E2-1800 (E135 sports a faster 7200 rpm HDD). 2367M systems are approx. 50% faster. PCMark Vantage's 3740 points reveals the same: AMD's E2-1800: -29%. The i3 version is, depending on the HDD, either not at all faster (Travelmate B113-M) or only 13% faster (Asus UX32A). 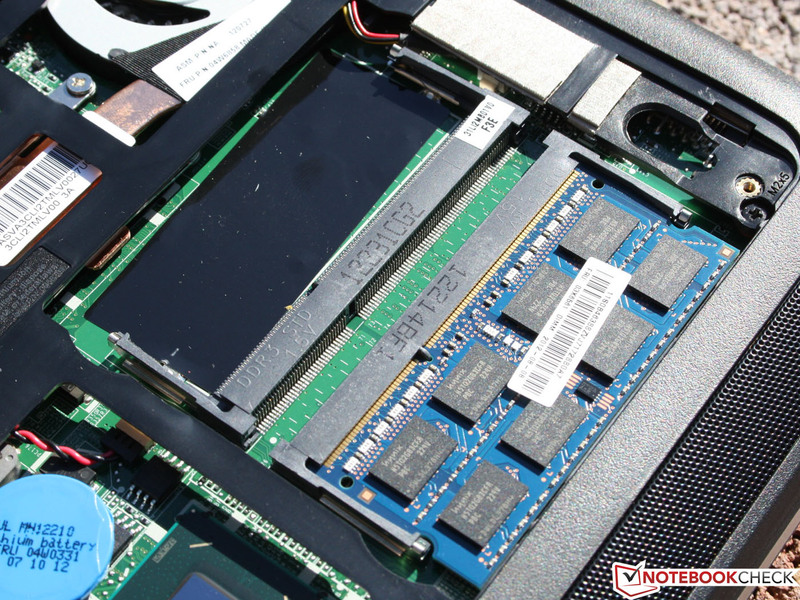 The i3 would be roughly 50% faster alongside an SSD (PCMark Vantage), as can be seen in Toshiba's Portégé Z830-10N. PCMark 7's system storage score above shows just how big the differences among HDDs can be. The E135 model has a remarkably swift 7200 rpm hard drive in the form of Hitachi's 500 GB HTS725050A7E630. Seagate's Momentus Thin ST320LT007 320 GB 7200 rpm in our E130 is not bad either and achieves rarely seen maximum transfer speeds of 90 to 118 MB/s. The fairly short access time of 17.8 ms is particularly striking. However, the HDD is again in the midfield of all hard drives in 4K read. An SSD could easily boost the 4K rate to 2243% (see Toshiba's Z830-10N, i3-2367M), which increases the experienced work speed considerably. The HD Graphics is weak in the 3D benchmarks. DirectX11 benches do not run at all due to the lack of support. 2293 points are achieved in the old 3DMark 2006. The HD 7340 in the E2-1800 only calculates a bit faster with +8-10%. The i3-2367M's HD 3000 processes up to 42% faster, for example, in Asus' UX32A. The gaming performance is accordingly moderate. However, the HD Graphics or Radeon HD 7340 (Edge E135) only differ in detail. The performance impression is very bad across the board. Even FIFA 13, marked in green, occasionally stutters in minimum details and was partly unplayable in medium details. The E135's performance was almost the same in this game. The E130 behaved as we expected from an Office device: nice and quiet at all times. The fan was occasionally deactivated in idle, but that is rare during basic tasks. However, the 7200 rpm HDD's quiet noise is always audible with 31 dB(A). Hitachi's drive in the E130 is a bit quieter than the Seagate in the Edge 135 (32.3 dB(A)). The noise level increases to 34.8 dB(A) when the Pentium processor alongside its graphics is loaded by benchmarks and it then spins constantly. A slightly lower 33.8 dB(A) is achieved when only the GPU is calculating. The E130's waste heat stays mostly stable in Office use or homogeneous load. It only increases by a few degrees in a few hot spots. Switching between maximum load and idle illustrates this quite well. 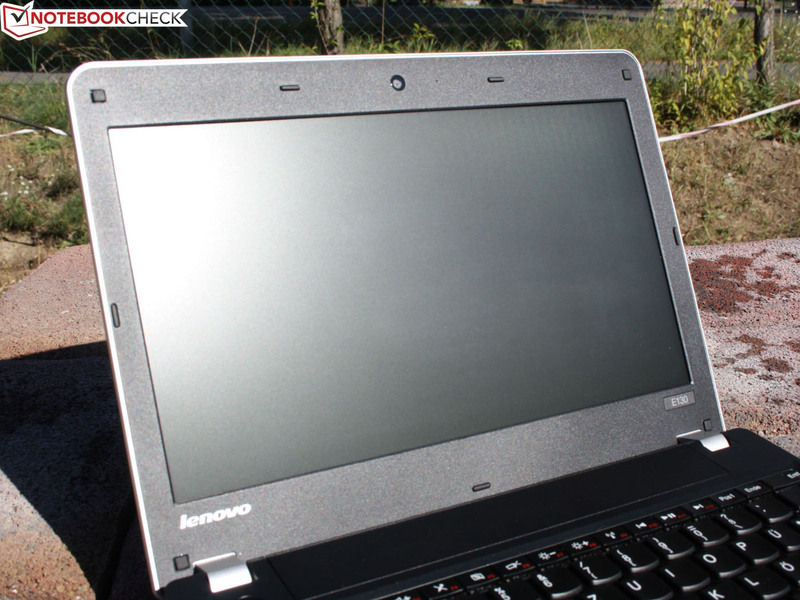 The temperatures are nevertheless still acceptable for lap top use because 40 °C is only exceeded selectively. Besides that, we have to admit that our stress test is an unrealistic scenario. Throttling is not really an issue for the Pentium due to the lack of Turbo Boost. The CPU clock remained stable at 1.4 GHz in the CPU stress test. 3DMark 2006, performed afterward, finished without irregularities. (±) The average temperature for the upper side under maximal load is 36.9 °C / 98 F, compared to the average of 30.7 °C / 87 F for the devices in the class Subnotebook. (-) The average temperature of the palmrest area of similar devices was 28.6 °C / 83.5 F (-9.6 °C / -17.3 F). The sound of the two speakers is appropriate, but not particularly good. The speakers are located on the base plate's front area and radiate the sound toward the tabletop. That reflects the sound waves and ensures an evenly distributed sound. The sound is treble-heavy and there are absolutely no basses. The volume can be set quite high without making the speakers rattle or clatter. External loudspeakers can be connected via the microphone/headphone combo. 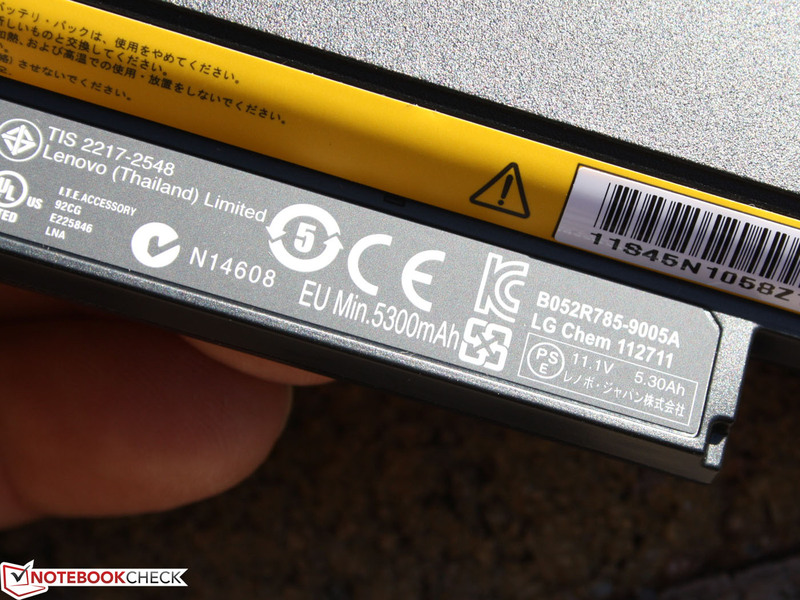 Low power requirement always points to a good runtime, providing the manufacturer did not make cutbacks in battery capacity. This is fortunately not the case in view of 63 watt hours. The power consumption ranges between 7.5 watts in idle mode and 33 watts during high performance (3DMark 2006). A 3DMark 2006 needs 27 watts and is representative for games. The E135 APU system is only marginally more efficient: we measured 7.7 to 10 watts in idle (minimum/maximum). However, the load situations make the difference, where the E2-1800 laptop only consumes 24 to 29 watts (3DMark 06/stress test). Consequently, the E135 should provide longer runtimes during heavy use (battery and screen are identical). The 65 watt PSU is designed very generously for this power consumption. It recharges the battery completely in 2:41 hours even during maximum load. The battery runtimes easily satisfy high demands. In cases where the Aspire V5-171 and the Travelmate B113-M exhibit weakness due to their 37 watt hour batteries (three hours), the much cheaper Edge E130 runs for six hours. We are talking about the Wi-Fi test using a brightness of 150 cd/m2 (slightly lowered), energy-saving mode and disabled Bluetooth. A script opens a website, some including video contents, every 40 seconds. The E135 APU model runs for exactly the same 368 minutes. APU-based models can run for a longer time, like Samsung's 305U1A proved early this year. The 11.6-incher lasted for 8:27 hours (507 minutes). The battery is first completely drained after 3:15 hours even during constant CPU load induced by BatteryEater Classic test. However, the fairly high weight of 1.518 kilograms has to be accepted in favor of the good battery life. The too dark screen is unfortunately not as ideal for outdoor use. The battery's charging behavior can be modified via the Energy Manager. If you waive on half an hour of runtime, so only enable a battery charge of 95%, you can increase the battery's service life. Complaining on a high level is part of a notebook tester's job. A rating of 86% however defuses any larger points of criticism. 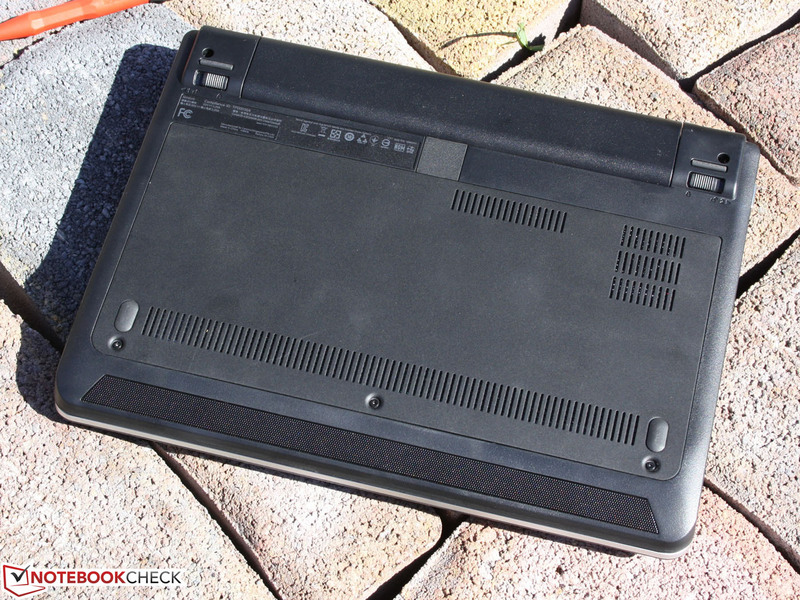 The customer gets a solidly built subnotebook for a price starting at 375 Euros (~$488). It is neither extremely thin nor extremely lightweight. In return, the input devices are beyond any reproach and the non-slip surfaces are a delight. 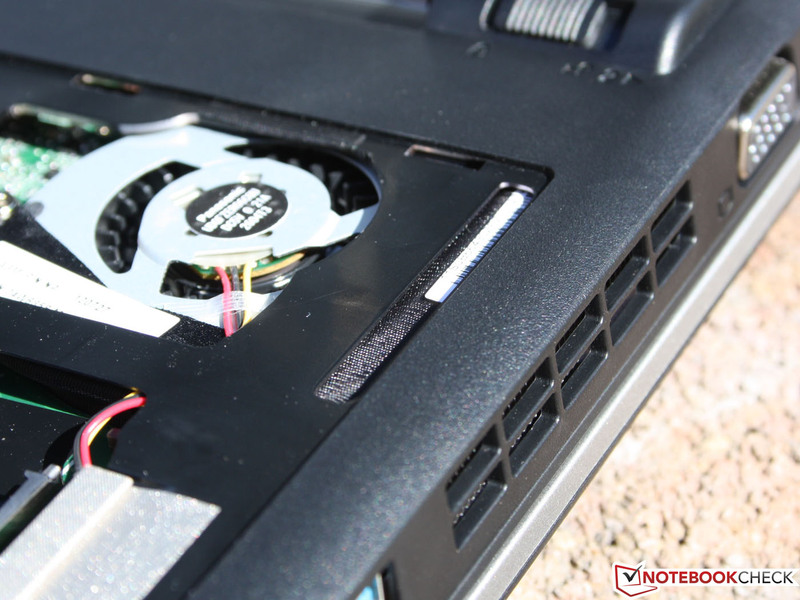 Performance fans will turn their backs on a 5400 rpm hard drive and Pentium processor. Everyone else will be satisfied by the Office performance because it is fused with a runtime of over six hours. The not very bright but matte screen is unfortunately not suitable for use on the terrace. The 11.6-inch laptop is always adequately quiet in the office. 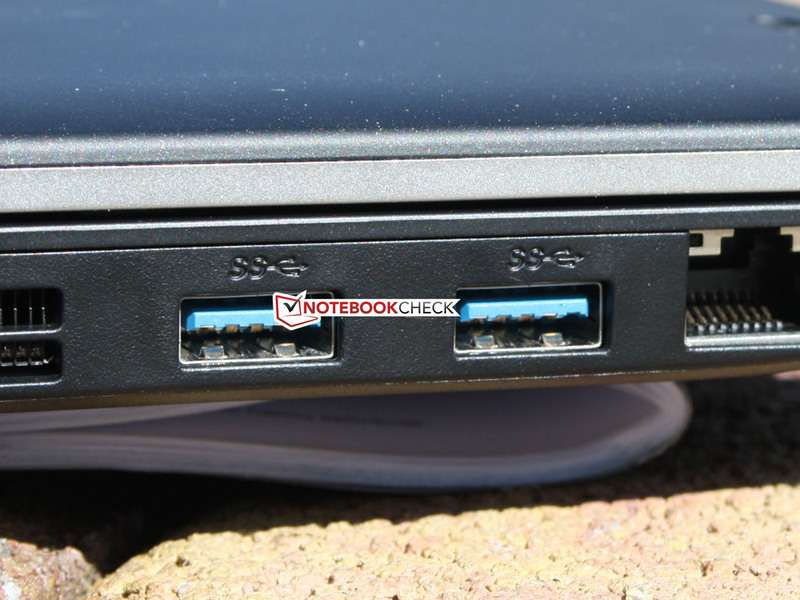 Extensive peripherals can be connected thanks to the two USB 3.0 ports and HDMI/VGA. A USB 3.0 dock featuring ports for external screens is certainly a tempting idea to prevent a cable mess. In terms of software, the ThinkVantage tools make a clearly arranged and sensible impression. If you now believe this device is a personal must-have, you might want to wait a few days for the in-depth review of the look-alike Edge E135. The sister model features AMD's E2-1800 APU (HD 7340) and a swift 7200 rpm HDD. Looking for an affordable subnotebook? lift the lid and that's it. and the fan can be cleaned easily. The hard disk has a height of only seven millimeters. SSD memories are also available in this height. A second mini PCIe port is not available (beside the Wi-Fi module): The connector is not soldered. is made possible by the 63 watt hour battery. The 65 watt PSU can sometimes be left at home. It weighs 245 grams without the cord. We would have preferred a simple power cord. The speakers are on the front behind the perforated grille. An aluminum body is simply not possible for EUR 400 (~$521). You want one that runs for at least five hours? One that is small enough for daily transportation? to even look good on the desk? You want to type your term papers on it? Or click through file trees for hours on end? And the whole thing should not cost more than 400 Euros (~$521)? 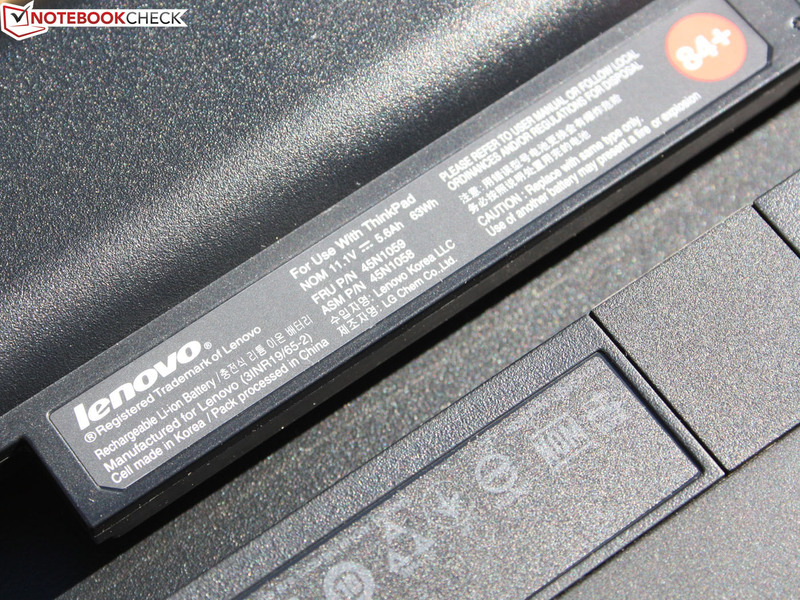 The ThinkPad Edge E130 fulfils all these criteria. So, off to the next store and then into the sun? Not so fast because perfectionists will find drawbacks in details. The interfaces are all on the sides and no longer on the rear (Edge 11). The matte screen is too dark in direct sunlight. 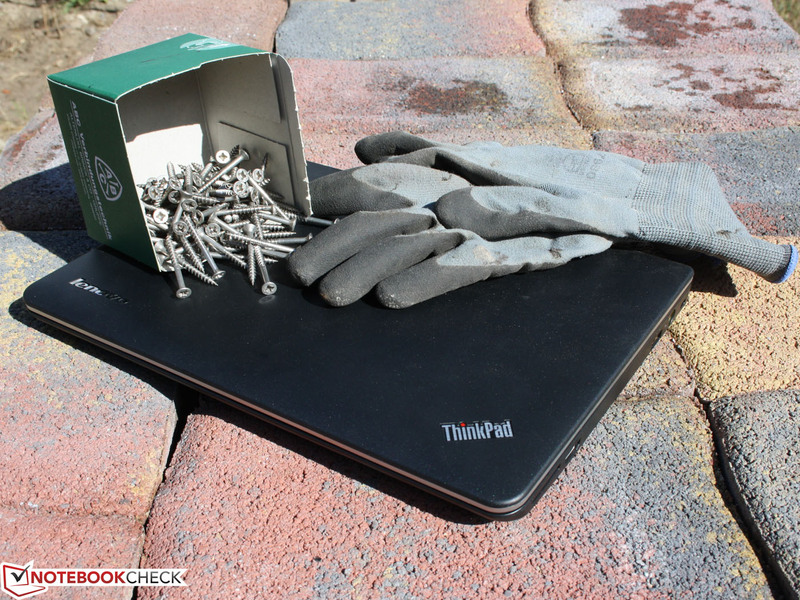 Lenovo's ThinkPad Edge E130: A solid, versatile mini at a bargain price. Keys and Dual Pointing are easy to use right away. Such a good keyboard is not found anywhere in this price range - not even in bigger laptops. Long key drop, clear pressure point, conic recess - typing can't be more comfortable. A brighter screen so that we can browse on the Internet again next summer. More performance with a SSD? It would almost be presumptuous to ask for this in view of the price. 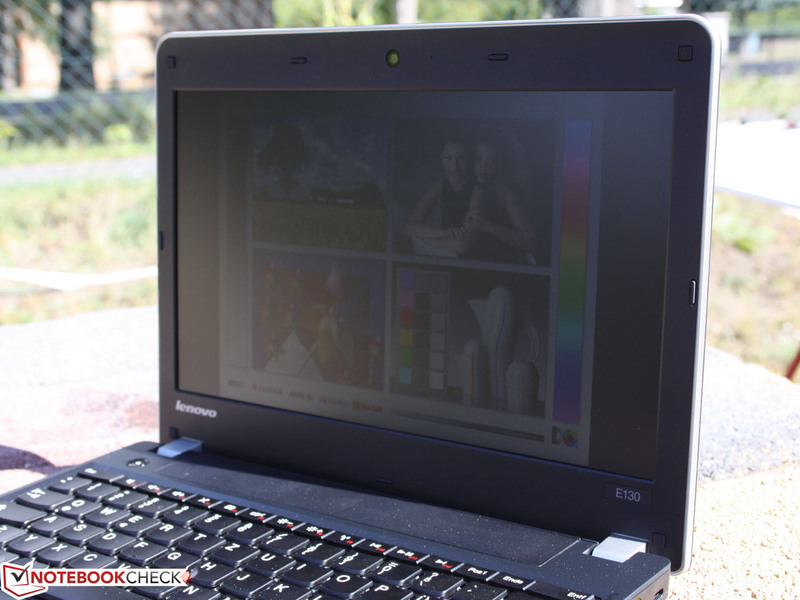 How Lenovo can offer this quality 11.6 inch device at such a low price.